Flour in my hair, flour on the counters, flour on the floor: I’m prepping for tonight’s baking class, week 1 of a three-week session. This week’s lessons will cover measuring, kneading, and understanding what each component in a yeast-bread recipe contributes to the finished loaf. We will also handcraft a loaf of seeded bread, lightly sweetened with Steen’s cane syrup, while also talking about bread’s central role in Western culture. 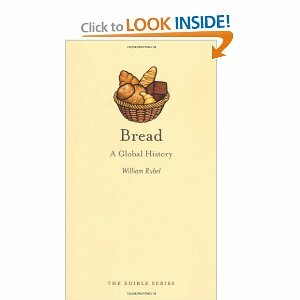 To help focus my thinking on bread, I recently read Bread: A Global History by William Rubel. This slim volume is as densely nutritious as a whole-wheat loaf, packed with photos of Egyptian grave breads and ancient sculptures of kneading and baking. It provides the wide-angle view of bread as a foodstuff and a cultural product. Goodness, been there and done that mess. Sometimes I just don’t start cooking because I know I won’t feel like cleaning it all up. Bread making has always been one of my favorite occupations. Especially the years I was so strapped for cash, and homemade breads made me able to put something special on the table. Plus, I love real butter on a hot slice of just-out-of-the-oven, thickly-sliced crusty bread! Bread is sacred. I still say, “Break Thou the bread of life, dear Lord with me, as Thou did break the loaves beside the sea…,” from the old hymn every single time I break bread.